We took the month of July off with our Webinars, and we know you missed them (you told us). But we're back and ready to go. Here are 3 new classes scheduled for August. Each class will be limited to the first 1000 people to sign up, but if you miss out or can’t make it, don’t worry because we will record the class for you to download and watch later. The genealogy bug has bit you and you want to do more than just record what you already know. RootsMagic is there to help with a large assortment of research tools which help you set goals, make to-do lists, track your progress, and even suggest places to look. Join us for a look on how to extend your family tree further than ever before. Everybody needs a little help from time to time. 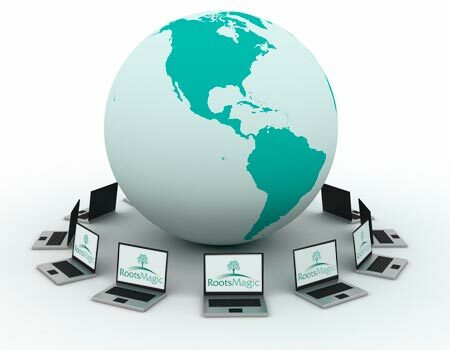 Nobody understands this better than RootsMagic so we're pleased to offer many different methods of getting help for our software products- all free. Join us for a look at the many ways we provide answers to your questions. You're a Mac. RootsMagic is a PC. Or is it? Join us for a look at how thousands of Mac users are still using RootsMagic software on their computers- some WITHOUT even using Microsoft Windows at all. And don't forget that all the previous webinars were recorded, so you can download or watch them online for free. Or if you don't want to access them online, the webinars are now available for purchase on CD. We have packed 10 webinars on each CD, and priced each CD at $9.95. Click here for more information or to order the webinar CDs.